Writing the guide for the GR 1 has been a mega winter project. I've completed a first draft but now there is a ton of checking and gap filling to be done, and pulling together all the maps and photographs is taking forever. With plans for other walks coming up fast and furious, the challenge is to sustain the enthusiasm needed to finish it. A ready source of motivation is the prospect of another visit and a walk through some of the best bits of the whole GR1. 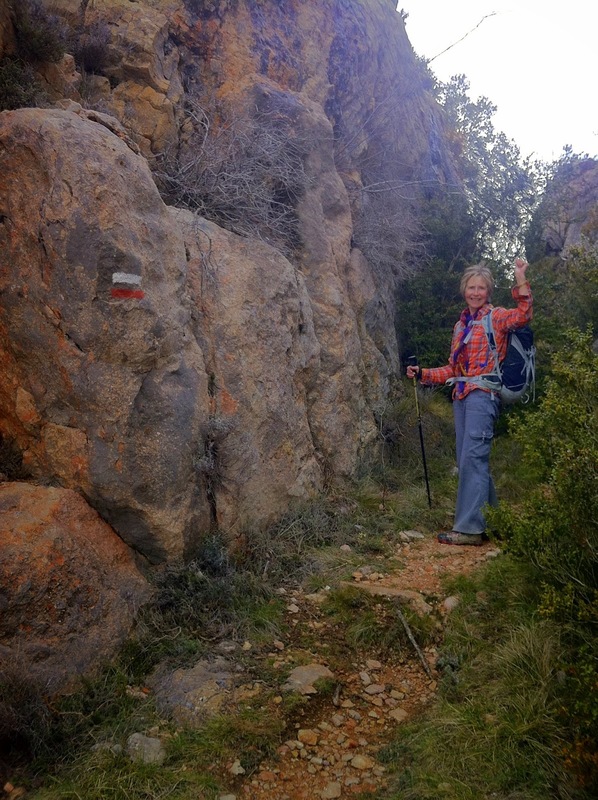 From the 11th to the 27th of April, Christine and I are walking from Riglos in Aragon through to L'Espunyola in the heart of northern Catalonia. My Spanish friend Juan Holgado has booked all the accommodation so all we have to do is put one foot in front of the other. I'm particularly looking forward to the first 6 days from Riglos. I think this is my favourite part of the GR1. It is really special. It has amazing scenery including the red cliffs of the Mallos de Riglos and the canyons in the Parque Natural de la Sierra y Cañones de Guara; important historical locations, particularly the Loarre Castle, arguably the world's most important Romanesque castle; and lovely hidden spots where a bit of wild swimming might be possible. What I really want to show Christine, who didn't walk this stretch with me last year, are the abandoned villages between Arguis to Paules de Sarsa. They are spooky, almost post apocalyptic, and with signs of habitation everywhere it feels as if the population left overnight. I'll be blogging every day on a schedule which is similar, although a little faster, than the schedule I've developed for the guide. We fly to Barcelona on a Friday and catch the train to Huesca, stay the night there and catch the mountain train next morning up to Riglos to start the walk. The first day is an easy 17km but spectacular. The huge Mallos de Riglos, formed of a red conglomerate rock containing pebbles the size of potatoes, draws climbers from around the world and the cliffs are a favourite nesting site for vultures. After visiting the spectacular ruins of the Torres de Marcuello we'll follow a cliff top walk to the Loarre Castle with great views south across the Hoya de Huesca. The next day is tougher, 30km to Arguis, and follows a route which I think is an improvement on the GR1 (avoiding a road walk). After visiting the little towns of Aniés and Bolea we'll climb the Pozo de Nieve pass and continue along a ridge up to 1500m. On day three we enter the Parque Natural de la Sierra y Cañones de Guara, visit the first of the abandoned villages and, as the walk is only 20km, might have time to put our feet in the water and find out just how cold it is. Nocito is a tiny but very pretty little village and sits underneath the Guara mountain, the only 2000m plus peak in the park. 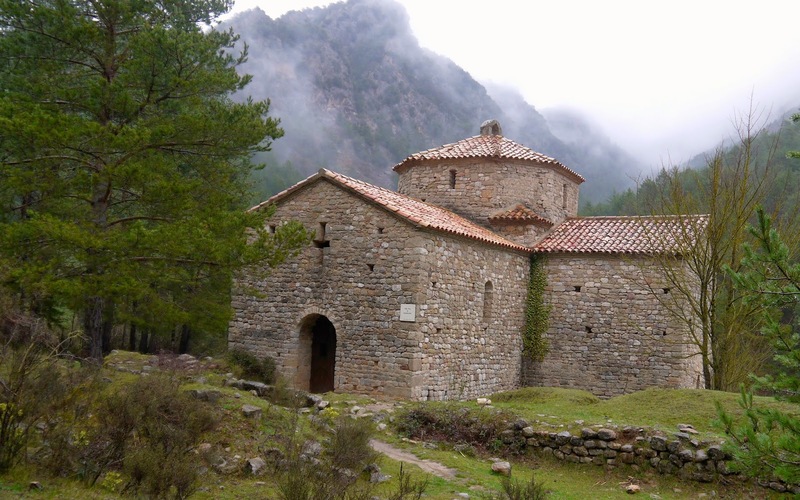 On day four we'll combine two of the guidebook stages and walk 30km to Paules de Sarsa. 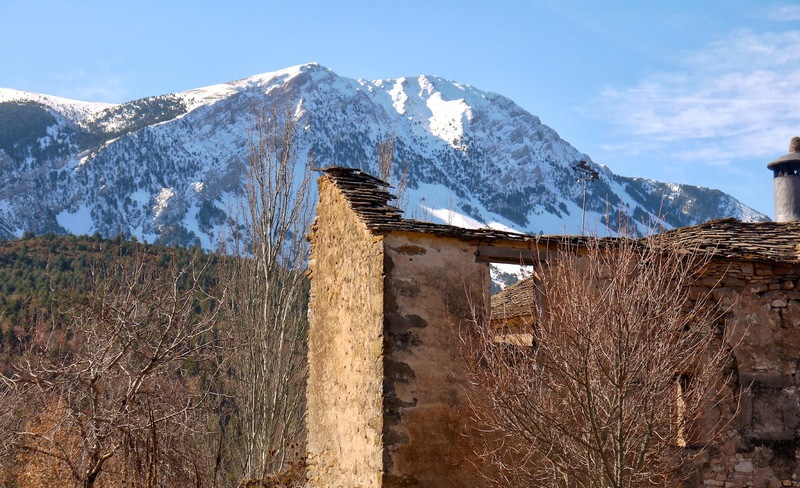 The abandoned village of Nasarre has fantastic views of the Pyrenees and if we don't stay there too long we might just have time to make a quick detour and visit the canyons at Otin. The best bits on day five are at the end of the walk, and after 33km we might need a bit of encouragement. Time pressure means we will probably give the climb up to the castle at Samitier a miss, but there is no avoiding the wonderful gorge which we have to pass through to get to El Humo de Muro. Next day involves a 24km semi-circular trip around what feels like a secret hidden valley (really a basin) - the Fueva valley - a walk I missed last time. Although I'm looking forward to visiting the hilltop town at Troncedo, the food at the casa rural in Salinas de Trillo where everything is home produced is the real treat. Day seven is an easy 26km walk initially through trees and then across a potentially windswept plateau all the way to Graus. It will be Good Friday, a particularly important holiday weekend for the Spanish, and finding accommodation has been tricky so we'll stay at the same hotel for two nights. Graus is also the first place since Huesca where there is an ATM. Day eight involves a walk I haven't done. Last time we did a detour up to Roda de Isabena, a particularly gorgeous place which Juan rightly wanted us to see. For completeness this time we'll follow the GR1 proper and walk 22km to Lascuarre. We did most of the next day's 33km walk last time, but the weather was poor (so was the waymarking) and I'm hoping to do a better job this time. It's an interesting route, very varied and lots to see. The highlight is the semi-abandoned town of Montañana. It has the same spookiness as Tintagel but is inland and much larger. The first part of day 10 (27km) is dull, a lot of unavoidable road walking, but it gets dramatically better. The Noguera Ribagorcana is one of three gorges that cut through the Sierra Montsec, the range we'll spend the next three days crossing, and is the perhaps the best. The cliffs are immense, 500m, and at times the gap between them is less than 20m. Its a fantastic walk to Ager which I'm sure we will be sharing with others. Day 11 is another long day with one of the hardest climbs of the GR1. It is however an excellent day's walk and, if luckier with the weather than last time, we'll get excellent views of the Pyrenees. Unfortunately the days since the Hostal Roig provided accommodation are long gone and a taxi down to Vilanova de Meià has been organized to find accommodation. Day 12, 25km to Meçaners, is the last of the three days needed to cross the Sierra de Montsec. I'll be using it to try and resolve some confusion about the GR1 route with the custodian, the FEEC (the Catalan Mountainering Association), having it go one way and everyone else another. Trouble is that 'everyone' else route is shorter with potentially better views. Day 13 is a little messy. To fit our schedule, we are going to miss out a short stage from Oliana to Cambrils but I suspect we won't even get to Oliana. The temptations presented by the opportunity for a boozy lunch-stop in Permola will probably be too great and we will end up getting our taxi from up to Cambrils from there. Day 14, from Cambrils to Sant Llorenc de Morunys is also a little frustrating. The first half of the route follows an old road running parallel with a new road and you can see why it was replaced - at times it's almost impassable and hard work. I hate walking along roads but this time I might swallow my pride (and perhaps stick my thumb out). For day 15 the plan combines two big guide stages into one mega stage and involves walking all the way to L'Espunyola. It's about 40km and at least 2000m of climb, but includes some spectacular scenery. If we don't feel up for it we can always do what we did last time (when it was raining) and get a taxi to a point half way but I would rather finish with a bang. I have yet to consult Christine about this. It will be Sunday next day and our flight back from Barcelona isn't until late afternoon, so we should be back in Brighton by the early evening. Could work! 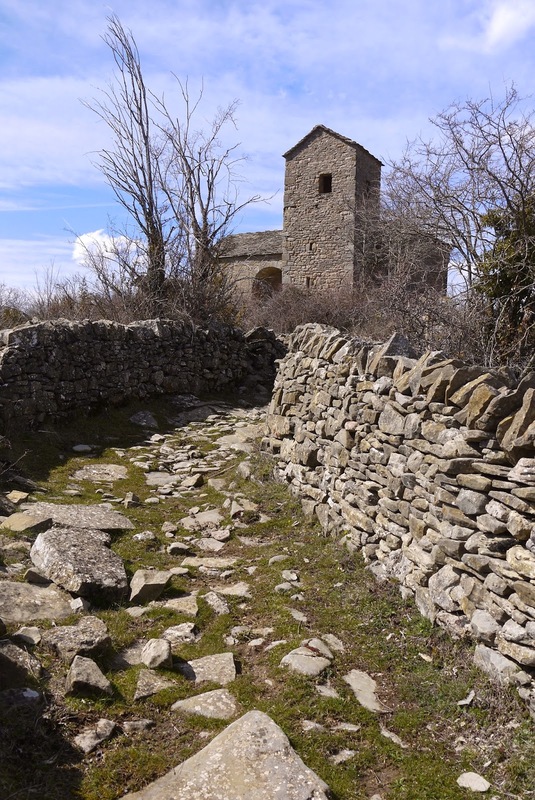 Inspired by your enthusiastic account we are going to Spain on the 27th April and walking westtward on the GR1 for 23 days starting at L'Escala and ending up somewhere north west of Huesca.It is a bit early in the year for the high mountains and the Sendero Historico looks like a good route. In Catalunya will be mainly following the route on the Cataan IGC maps although inevitably with the occasional weather or accommodation related deviation. Not sure what we will do about the section between Oliana and Ager but will probably arrange a taxi pickup at Coll de Corniols. Please let us know if you would like us to collect any information for your book or provide any route details and will try to comply. Hi David and Carole. Great to hear from you again and so pleased you're doing the walk. There is a party from Cicerone starting at Riglos about the same time but they are there for just 2 weeks so I do think you will quite meet up. Any help please, particularly photographs. You'll have the sun behind you in the morning so a completely different perspective. I can send you the GPS trail if you use one (an email direct to me please) although in Catalonia the signs are good and there is some excellent info on the FEEC website (https://www.feec.cat). I will also send you more info on where I'm staying, including how to book if you want to. If you stay at Cambrils then next day I would go all the way to Peremola, next day Mecaners and Hostal Roig and a taxi down to Vilanova de Meià. You can then Ager the next day. Hi John. I am just back home from the GR160 Camino del Cid which I walked the first part from Vivar del Cid (Near Burgos) to San Esteban de Gormaz on a 185k trek. Anything you may need I will be ready to help. Welcome to Spain again and have a nice time on the GR1 Sendero Histórico. Just wanted to let you know that I'm going in February to try 2 weeks along GR1. I want to start in Arguis and see how far I get. I will be taking my tent and will walk solo. I hope I don't run into any issues with navigation, as that's my only worry. I have the guide (for kindle) and will look for maps in Barcelona. I also hope there is no late winter! :) Thank you for all the information, it convinced me to choose this trail! Maps are really hard to come by and where you can get them they don't generally mark the route. The waymarking is good for 90 per cent of the way but occasionally there are gaps. The best thing to do, and I talk about this in the guide, is get an app on your smartphone, download the digital maps and download the route. If you do this, and learn how to use it before you set off, you will not have any trouble navigating. If you have any trouble let me know.